Sizing John will not defend his crown in the Timico Cheltenham Gold Cup next week, trainer Jessica Harrington has announced. The eight-year-old carried all before him last season, but this campaign has not gone to plan after an impressive return in the John Durkan Memorial Chase at Punchestown in December. He was sent off the hot favourite after that to win the Leopardstown Christmas Chase but was wellbeaten in seventh place, and although Harrington was hopeful he was returning to his best for the Festival, a " hairline non-displaced fracture of his pelvis" has dashed plans. 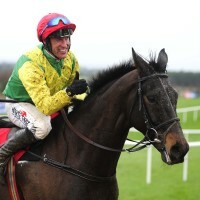 Harrington told Unibet:"It is with a heavy heart I have to report that Sizing John will miss the Cheltenham Gold Cup. He cantered as normal this morning at Commonstown and during routine checks this afternoon was found to be sore behind.
" I have had our vet Mark McRedmond come and check him over. He has found a hairline non-displaced fracture of his pelvis. He will have box rest for two weeks and then be rescanned with a view of starting walking exercise. "This is a massive blow for the Potts family and for all our team here at Commonstown." Harrington is still set to be represented in the Gold Cup by Our Duke.